Even non-gardeners plant annuals, and we all have our favorites. Often our favorites are simply what performs best or is easy to car for, so even experienced gardeners get in a rut with the selection of annuals. Spring comes with a long to do list, so plan ahead to find new annuals to try in your garden. Browse garden catalogs in winter or plan a trip to the garden store just to browse for ideas. Once you have a few possibilities in mind, walk your property to decide which new annuals to try where. Pots are always an easy space to experiment, or a space in your garden that is bare or occupied by a failing plant. If you have been designing with perennials, tuck a few annuals in the bare spots, or to add to season long color between perennial blooming. 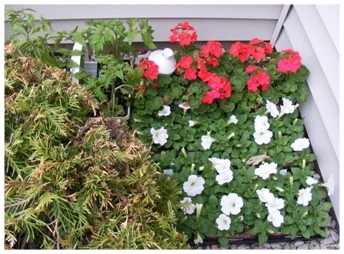 When we buy annuals each spring we want them to look great right away, and get even better as the season progresses. So it is important to know what to look for when selecting your annuals at the garden center. There are many opinions regarding buying to early. Some homeowners prefer to buy their annuals after the frost danger has passed and plant them right away. In so doing they avoid storing the annuals and keeping them alive in those tiny little pots until planting time. But if you prefer to plant unusual or very specific annuals, or like to try some new things every year, you may want to consider that the best time to buy is when you rind healthy plants that you want. Garden Centers tend to receive their shipments in batches, so you may need to check a few times and start early. The week that is "safe to plant" in your area, the garden centers will have the largest selection of plants available. But the stores will also be very very busy. And some of those plants will have been at the garden center perhaps for a few weeks, and may have been neglected by temporary seasonal staff. Since most garden centers slowly start receiving their stock well before the safe planting date you can often find very fresh and healthy stock it you shop early. You won't have to fight the crowds but stock may be very limited. It will be worth stopping in if you find that special annual or just what you want that is fresh from the greenhouse. Storing the annuals until planting time is not difficult, but you must pay attention and take proper care. Check them daily to make sure the soil is moist. They can certainly stay outside as long as the nights stay above 38 degrees (remember that air temperature is taken a few feet off the ground and it is colder at ground level!). If it gets too cold just put them in the garage for the night and back outside in the morning. It also stays a bit warmer up on a deck or along the wall of a heated house. In order to collect all the favorite plants I want I am often picking them up over a period of about three weeks. I have never lost a plant in storage, but I do monitor them carefully. If a plant is quite large in a small pot, a very light dose of liquid fertilizer will keep them healthier when storing for a few weeks. Pale or yellowing leaves will give you a hint. Look the annual plants over carefully for signs of good health and vigor. Foliage should be well shaped with strong color. You should see signs of new growth and buds. Look for signs of fungus or disease, usually displays discolorations in the leaves or stems. If you spot insects or insect damage on the plant, either pass it up or check with the staff to determine whether the problem is serious. Checking the roots is not always easy unless you tip it out of the pot, or a very gentle pull will bring the root ball up from the pot. Ideally you would like to see a strong root system and avoid girdling roots. Girdled roots will circle the pot, around and around the soil ball. Girdled roots are not necessarily a problem, as a matter of fact a vigorously growing plant will tend to girdle such tiny pots. But if the plant is sensitive to its' roots being disturbed, untangling the roots for planting may damage the plant. Most annuals that are severely root bound can be sliced with a sharp knife when planting to encourage new root growth. When you have exposed the roots they should be more or less white. If they appear blackened or slimy choose a different plant. If half or more of the soil stays in the bottom of the pot when the plant is removed, the plant has not established well and will struggle in your garden. The complete name of the plant, species and variety. Sometimes you will see a common name and a botantical name. The requirements of the plant including sun, soil, water and feeding needs. The average height and spread of the plant at maturity. I avoid buying the annuals with the most open flowers. Lots of flower buds is fine, but plants with a lot of open flowers will not establish quickly in your garden. The plant is too busy blooming. Depending on what or where I am buying, I sometimes like to see at least one bloom open. This allows me to confirm the actual flower color, or when trying something new you can also see the bloom form. Ideally you should remove open blooms when you plant so the annual can concentrate on establishing roots. Before you go to the nursery, take a few minutes to walk your property with a a pad and pen. Make a list of how many plants you need and of what type. Because I often like to try new annuals, my lists are categorized by planting area or specific pots. For example "3 geranium and 2 petunia for window box", "3-6 plants each for 2 patio pots, part sun", "Find something that does better for shade for 2 patio door pots", etc. That way I can adjust for new fun things if I see them! Have some fun with your annuals, try something new this year!